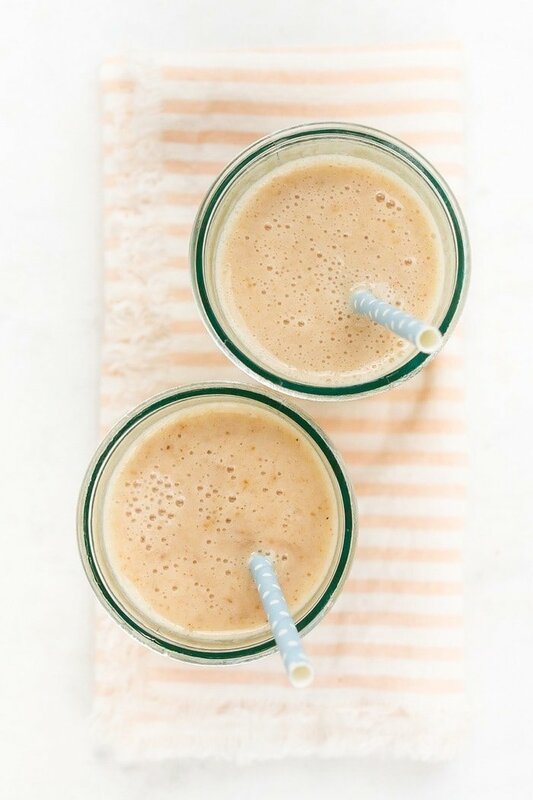 This healthy date shake is made with frozen bananas instead of ice cream and requires only four simple ingredients. It’s dairy-free, gluten-free and vegan. Date shakes are a well-known Palm Beach dessert. While I’ve never been to Palm Springs to experience a real date shake I heard about their deliciousness from friends while at the Date Summit last year. Dates blended into a milkshake sounds like absolute perfection so I knew right away that I needed to recreate the date shake at home. To make it a tad bit healthier I decided to use banana ice cream instead of vanilla ice cream. This is an easy swap because frozen bananas work like a charm at creating a cold, creamy, milkshake-like consistency. They also add a little extra sweetness to the shake. The remaining ingredients are quite simple — dates, almondmilk and ice. 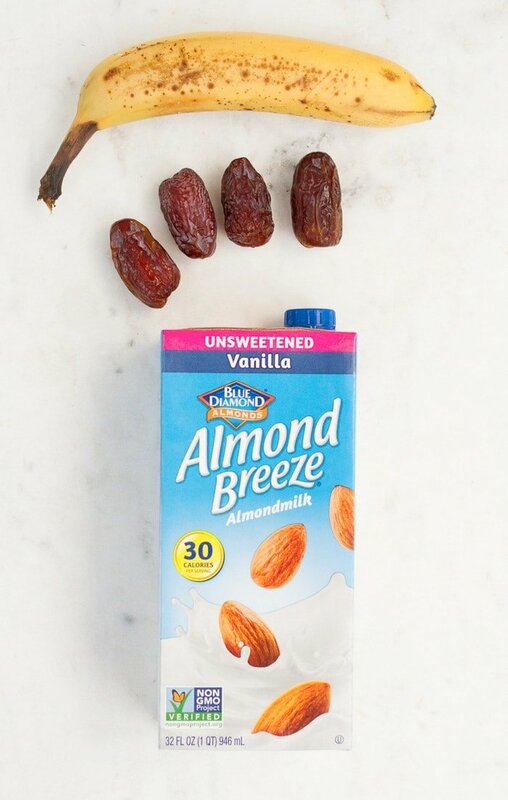 I used Almond Breeze Unsweetened Vanilla Almondmilk, which is my favorite variety, especially for sweet applications like smoothies and shakes. 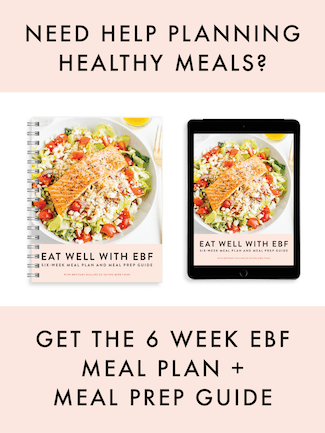 As I mentioned a couple weeks ago, EBF is teaming up with Almond Breeze for their Serve Up Your Best campaign. As part of the campaign, the brand is sponsoring the Team USA Volleyball athletes. When I think of volleyball my mind immediately goes to beach volleyball and I honestly can’t think of anything better than a healthy date shake to sip while sitting on the beach watching a volleyball game. Heck, it would even be a good option if you’re playing! I made these shakes on a day Maria was over and we both downed them in like 2.5 seconds. We were in the middle of cooking and shooting recipes, it was crazy hot outside and these shakes were the perfect cooling treat. 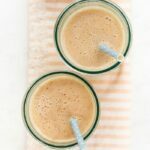 Of course this date shake is ideal for dessert, but considering it’s made with fresh fruit and almond milk I don’t see why you couldn’t have it for breakfast or a snack — especially if you’re headed to a workout. It’s full of energy and carbs to power you through! 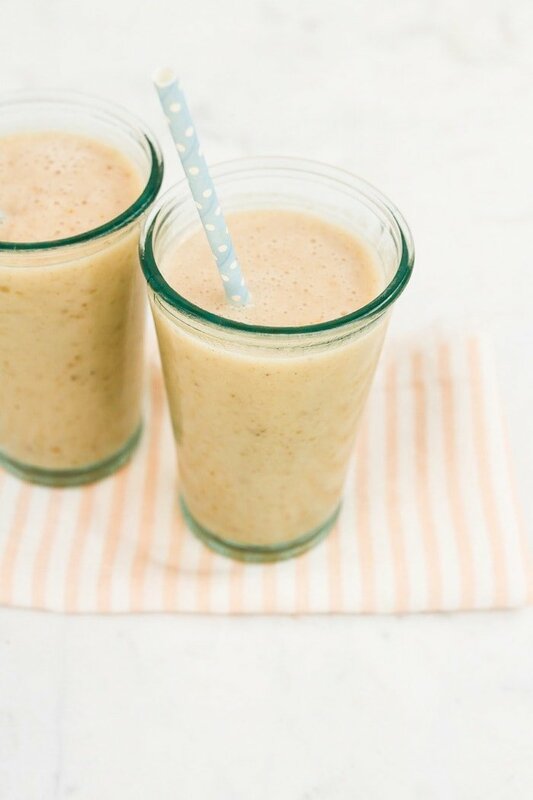 A thick and creamy date shake made with frozen bananas instead of ice cream. It’s dairy-free, gluten-free and vegan. This shake looks so simple and so good. Dates just make everything delicious. I definitely will give this a try with a little maca and almond butter added too! Mmmm this looks so refreshing! I love the combination of dates and bananas. Cute straws too! It’s the perfect summer treat! And thank you, the straws are awesome… until they get soggy and start to fall apart. You have to drink your beverage fast, which works for me because I drink everything quickly. Happy Monday, Kori. I bought the stainless steel straws the last forever! The smoothie was delicious! I could live off of dates, I swear – what a perfect breakfast. Hope you’re well, Brittany! Awesome Chris! You’ll have to let me know what you think of it. Okay, I am SO into dates lately. I’ve been pitting them and topping them with huge globs of PB 😛 I bet this tastes sooo delish. Me too! 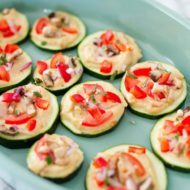 They’re one of my favorite snacks, especially topped with globs of peanut or almond butter! These look delicious! What a good idea! This looks very good. 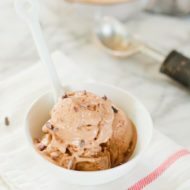 I love that it’s so easy to make and doesn’t require very many ingredients! Thanks for sharing. Of course, I hope you great a chance to try it! I came across this golden nugget of information and thought you might find it useful/interesting. …a prospective study was carried out on 69 women who consumed six date fruits per day for 4 weeks prior to their estimated date of delivery, compared with 45 women who consumed none…It is concluded that the consumption of date fruit in the last 4 weeks before labour significantly reduced the need for induction and augmentation of labour, and produced a more favourable, but non-significant, delivery outcome. The results warrant a randomised controlled trial. Yes, my search to incorporate dates into my diet before delivering my baby is how I ended up here as well. I’ve already been freezing banana slices to make ice cream, to help prevent leg cramps. What a bonus that this delicious shake has both bananas and dates. It tasted perfect! Thank you for this recipe. 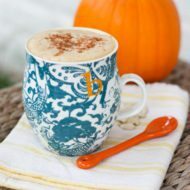 I agree this would be great for breakfast as well as quick refreshing sip during the day! Using bananas is also a nice switch up! Love how easy this shake is! Perfect addition to my list of healthy options for breakfast or as a mid-afternoon snack! What a great shake! We pass a date farm driving from Phoenix to San Diego and they always have a big sign, “Famous Date Shakes.” One of these days we’ll stop — until then, thanks for your recipe! I remember when I lived in Arizona my husband and I would always stop in Dateland on our to San Diego for a date shake, they were so good! 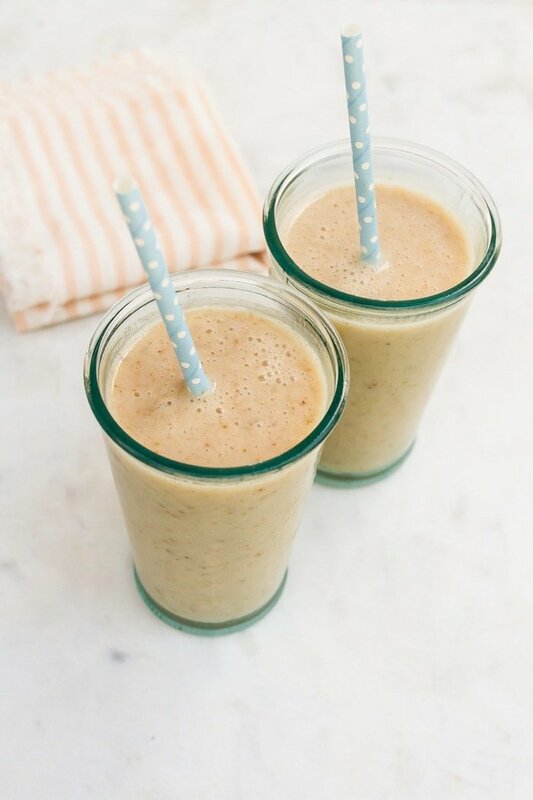 This shake looks so good, healthier and I don’t have to go on a road trip to have one! DELICOUS! I use unsweetened vanilla cashew milk and coconut water 🙂 Perfect! I also dd greek yogurt to mine for the pro-biotics or sometimes a little cinamon spice, just to switch it up a bit !! 47 grams of sugar is all the sugar you need in a day. If you were bringing the sugar down to 15-20, what would you change?